Today,in this article,we would discuss about the next step taken by Amazon towards development. Amazon is experimenting on delivering the packages to the customers through scout robots. They are basically small is size,six wheelers and similar to small toy truck. Six of the autonomous electric trucks will deliver packages at walking pace around Snohomish County. 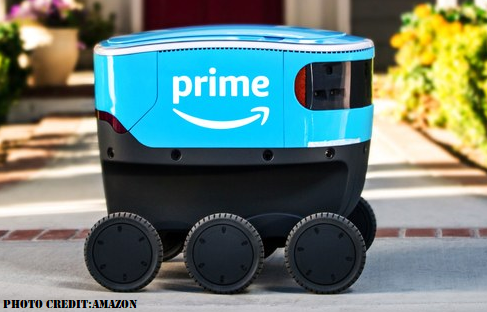 These delivery robots will operate only in daytime and initially, it will be accompanied by Amazon employee. Robots will deliver goods ordered for the same day, one day and two days delivery. While making these robots,developers had to make it perfect from every way. Not only navigation should be perfect, but also they have to keep an eye out about how will these delivery bots do when any pets or pedestrians come in way,and also what to do if some thief tries to steal the package. "We developed Amazon Scout at our research and development lab in Seattle, ensuring the devices can safely and efficiently navigate around pets, pedestrians and anything else in their path," said Amazon vice president Sean Scott on their company's blog. How will these delivery bots interact with the customers? In a promotional video,it has been shown that the small toy truck like robot is delivering a parcel,with a lid which is automatically being lifted when customer comes out of their home to collect the package. However,there are still some questions which are unanswered..
One of them being what will the delivery bot do if the customer is not present at the time of delivery in the destination? And,can this delivery bot achieve success in delivering package,if the weather gets too bad,when the bot is in its way to deliver the package?